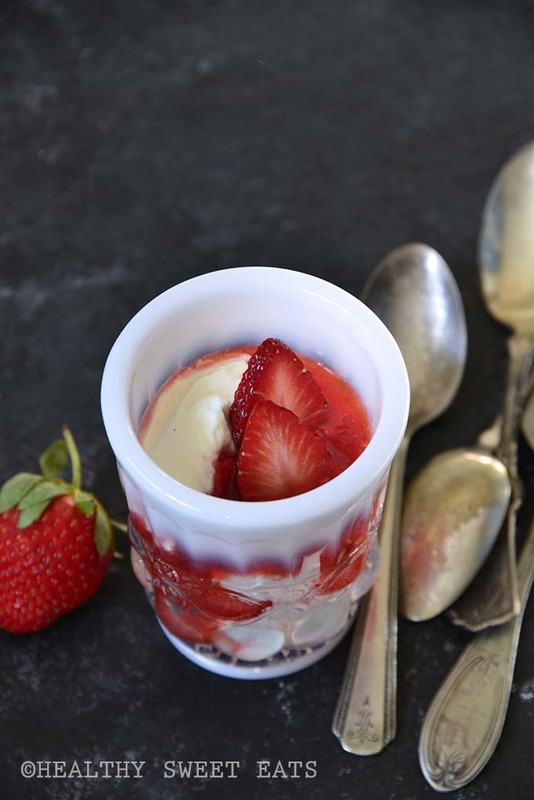 Low Carb No Bake Cheesecake Mousse with Fresh Strawberry Sauce has just 5g net carbs per serving (net carbs = total carbs – fiber), which is much less than a traditional cheesecake, but it’s every bit as satisfying! To reduce the carbs even more, make half a batch of the strawberry sauce. It doesn’t happen all that often, but I love when I have a dessert epiphany and come up with a single recipe that lends itself so well to tons of different – yet all equally delicious – variations of itself. Like the perfect brownie base that you can add whatever you want to, addictive little dried fruit and nut bites that you can switch up to suit your fancy, or a really great all-purpose cookie dough (I’m still working on developing my favorite healthy all-purpose cookie dough! )….